Disney-MGM Studios had a star-studded opening the likes of which a theme park had not seen before (although EPCOT Center would give any opening a run for its money). 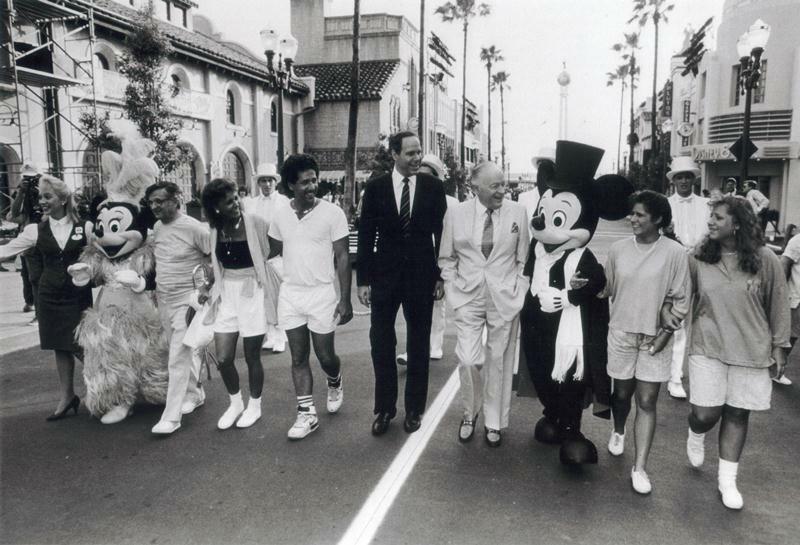 In the above photo guests are escorted down Hollywood Boulevard by Michael Eisner and perennial Hollywood entertainer, Bob Hope. Mickey Mouse and Minnie Mouse also help usher the group down the street, decked out in their finest garb, perfect for a Hollywood premiere. The backdrop for this glitzy gathering, Hollywood Boulevard, hasn’t changed much in the past twenty-three years. The neon signs still hang high above the crowds and the classic angles and architecture are all present. The scaffolding attached to what is now known as L.A. Cinema Storage withstanding, the building housing L.A. Cinema Storage and Celebrity 5 & 10 has seen a bit of a change. The awning the droops over the round doorways hasn’t been constructed yet and the Parking arrow hasn’t been applied to the brickwork. The more Hollywood, and Disney’s Hollywood Studios, changes, the more it stays the same! You're right Matt, Eisner did more to grow the parks and open new parks than any other individual, save Walt himself.